Soil organic carbon constitutes a large terrestrial reservoir with a potentially significant impact on global levels of carbon dioxide. Global warming may either result in mobilization of this reservoir (increase in carbon dioxide levels) caused by increased microbial decomposition of soil carbon. Alternatively, global warming and increased carbon dioxide levels may result in increased plant productivity leading to increased carbon deposition in the soil. Temperature-induced carbon mobilization from the soil would constitute a positive feedback loop possibly exacerbating global warming. Temperature-induced deposition of carbon would work into the other direction, attenuating global warming. To generate more insights into the factors controling this important reservoir, Crowther and colleagues analyzed samples from the upper soil layers from 49 different climate change experiments. 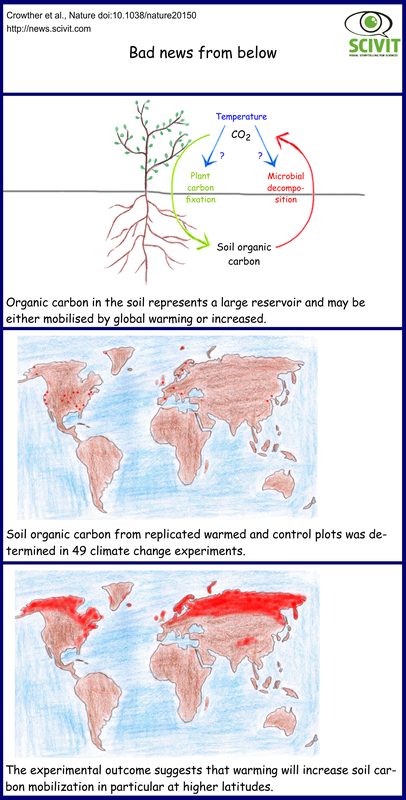 Comparing control samples with samples from global warming scenarios the scientists measured levels of soil organic carbon and the impact of warming. This impact primarily depended on the absolute amounts of soil carbon. In the case of very low amounts, warming resulted in a net deposition of carbon. In all other cases, however, the authors observed a liberation of carbon dioxide from the soils. This effect was particularly pronounced in samples from higher latitudes. The authors mention a number of caveats for data interpretation. Nevertheless, their results demonstrate the clear danger that warming beyond a certain threshold may initiate positive feedback circles further exacerbating climatic changes.